Inmate Louis Gibson cleans the windshield of a Louisiana State Police helicopter inside a hangar in Baton Rouge, Friday, June 2, 2017. He's been working on aircraft there for seven years, doing general cleaning and sometimes assisting with maintenance. Gibson, of New Orleans, was arrested at age 17 and convicted of murder after a shootout with a group of childhood friends. He is serving a life sentence without parole. The state House and Senate are expected to reconcile two bills that would provide about 300 lifers like Gibson a chance to appear before the state parole board. The House bill provides that chance after 30 years, the Senates after 25 years. Gibson has served nearly 24 years. Inmate Louis Gibson cleans the windshield of a Louisiana State Police helicopter inside a hangar in Baton Rouge, Friday, June 2, 2017. He’s been working on aircraft there for seven years, doing general cleaning and sometimes assisting with maintenance. Gibson, of New Orleans, was arrested at age 17 and convicted of murder after a shootout with a group of childhood friends. He is serving a life sentence without parole. The state House and Senate are expected to reconcile two bills that would provide about 300 lifers like Gibson a chance to appear before the state parole board. The House bill provides that chance after 30 years, the Senates after 25 years. Gibson has served nearly 24 years. In 1993, Louis Gibson was arrested at age 17 and sentenced to life without any chance of parole. 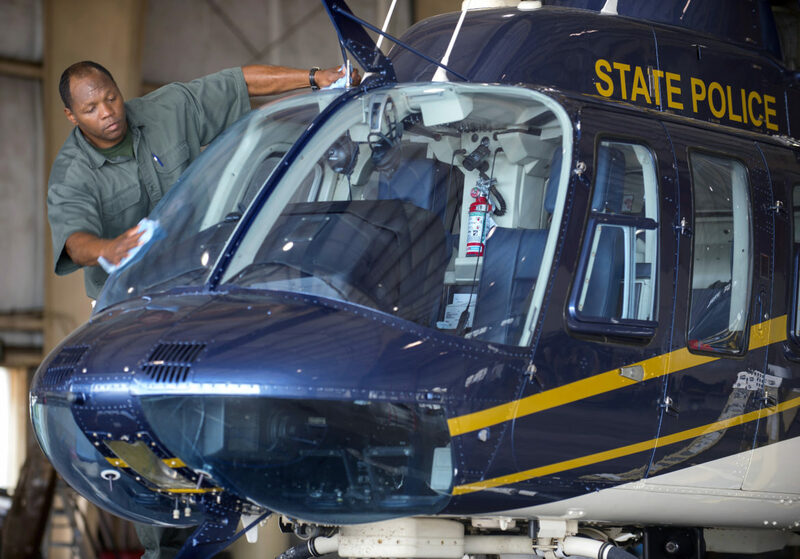 Today, Gibson, 41, is a model inmate, one of a select few living at the Louisiana State Police Inmate Barracks in Baton Rouge, where he does maintenance on state police aircraft. Until recently, it seemed he would die in prison. He was convicted of killing another teen, a friend he’d grown up with. But two bills passed through the Louisiana Senate and House could give Gibson and about 300 other juvenile lifers a chance at parole. First, legislators must resolve key differences between the House and Senate versions of Senate Bill 16, sponsored by Republican state Sen. Dan Claitor of Baton Rouge. The Senate version promises parole eligibility for juvenile lifers after 25 years; the House version offers it after 30. Cha-Chi Gibson holds a photo of her brother, Louis Gibson, in New Orleans, Wednesday, May 31, 2017. At the age of 17, Louis Gibson was arrested and later sentenced to life without parole after he shot someone he grew up with. Gibson, now 41, is one of about 300 juvenile lifers in Louisiana prisons who could get parole hearings if legislators pass a bill to comply with U.S. Supreme Court rulings. Both the parole eligibility and tightened future sentencing were recommended by a task force convened by Gov. John Bel Edwards in an effort to fight crime in smarter, more cost-effective ways. If enacted, the law will “mark a substantial win for Louisiana and for the country,” said Jody Kent Lavy, executive director of the Campaign for the Fair Sentencing of Youth, a national advocacy group. For the state’s 300 or so juvenile lifers, the true test of the legislation will be whether it allows for more than a few dozen of them to be released. Still, the legislation could be a big step for Louisiana, which has flown in the face of a few different U.S. Supreme Court rulings about juvenile lifers. At night, in his prison bed, Gibson replays in his mind what happened that night 24 years ago. He wishes he’d never driven with an older pal to a New Orleans hip-hop hotspot called the End Zone. They arrived around midnight. By 1:30 a.m., his friend Latrone Davis, 19, was dead. It seems like an all-too-common story of young New Orleans men turning to guns over small disagreements. But years later, the insights of those involved help to illuminate Senate Bill 16 by examining not only senseless violence, but also poverty, punishment and forgiveness. Latrone Davis at senior prom. Davis, a tall, handsome young man known as a peacemaker among his friends, was killed at age 19 outside the End Zone, a popular nightclub. His lifelong friend, Louis Gibson, was convicted of the murder. Though Louisiana soon eliminated mandatory life-without-parole sentencing for juveniles, it allowed the sentences after a hearing to consider mitigating factors related to the defendant’s young age and upbringing. Statewide, 75 percent of the juveniles who have had those hearings since 2012 have ended up going to prison for life. So the sentence still looks automatic, said Professor Katherine Mattes, who directs the Criminal Law Clinic at Tulane University Law School. Two years ago, researchers with Phillips Black, a public-interest law firm in St. Louis, found that Louisiana was one of five states responsible for the “vast majority” of juveniles in the U.S. serving life sentences. Because of that history, the effect of the Louisiana legislation will ripple far beyond Baton Rouge, Kent Lavy said. Juvenile lifers like Gibson have been waiting for Louisiana to act for more than a year, since the Supreme Court ruled in Montgomery v. Louisiana that states must offer them “meaningful opportunity” for release. Henry Montgomery, the plaintiff in that case, has been a prisoner at the Louisiana State Penitentiary at Angola since 1970. Claitor was a toddler when Montgomery was convicted mere miles from his district, he told a Senate committee. To him, the directive in Montgomery’s case seemed both clear and personal. “This is a mandate from the Supreme Court saying, ‘Fix it,’” Claitor told his colleagues. If Senate Bill 16 becomes law, no one will be automatically released. Juvenile lifers can earn a parole hearing if they meet certain behavioral and educational criteria and have served the required time, 25 or 30 years. The bill’s behavioral and educational requirements may present a hurdle for many. According to a preliminary estimate by the state Department of Public Safety and Corrections, 72 inmates have served enough time, but fewer than 1 in 5 of them met the other requirements to get a hearing. Claitor’s bill prompted hours of charged testimony in the House and Senate committees that oversee criminal justice. Tearful family members testified about teenagers who had brutally murdered grandmothers, young children and parents. A sheriff’s deputy described his shock at a particularly grisly crime perpetrated by a teen. “It’s difficult. Lives are torn apart; people are dead,” Claitor said somberly in a committee meeting after he’d heard the testimony. Dr. Kiana Andrew, a child and adolescent psychiatrist at the Tulane University School of Medicine, explained to the Senate committee that, until the brain is fully formed at about age 24, young adults are like cars that cannot stop. To put food on his table as a child, Louis Gibson worked odd jobs, carrying grocery bags to cars in Central City, then tap-dancing and shining shoes in the French Quarter. By fifth grade, when assigned an essay about whom he looked up to, he couldn’t write the truth: that he admired the neighborhood drug dealer. Since he was a boy, Gibson had to hustle for his dinner. At first, he carried bags for customers leaving the Venus Gardens Grocery in Central City, one of the city’s poorest neighborhoods. Then he’d buy some sandwich meat and bread and bring it home for him, his little brother and their two sisters. “Whatever I got at the store, that’s what we ate,” he recalled recently. Neighbors from that time remember feeding them and seeing little Louis using safety pins to hold tattered shoes together. Their older sister Zabrine Gibson Priestley, now 42 and a minister living in Texas, was molested at a young age and gave birth at 13. “I think that it’s only by the grace of God that we survived,” Priestley said. Cha-Chi Gibson, a security guard, has worked in private-security and sheriff’s offices for the past 16 years. “I’m on the other side of the law,” she said, explaining how she watched her brother negotiate high-poverty, high-crime neighborhoods in Central City and near the intersection of Tulane and Broad streets, where the Orleans Parish criminal courthouse stands. As Gibson got older, he tap-danced and shined shoes in the French Quarter. He recalled how, when he was a student at John W. Hoffman Elementary, a teacher named Mrs. Gabriel asked students to write about whom they admired. Louis Gibson, then 17, leaning against his burgundy Cutlass in early 1993. Soon after, he was arrested for murder. Louis, who was a good student, wrote how he wanted to be himself. He got an A. Several years later, when he ran into his teacher, she remembered the essay. He was the only student of hers to ever take that tack, she told him. His essay may have been well-crafted, but it wasn’t true. “In actuality, I wanted to be like the neighborhood drug dealer,” he said. “But I didn’t want to write that in my paper.” In his everyday world, working for that dealer seemed like his only chance for economic stability. Within a few years, Gibson had become a small-time drug dealer who hung out with a group of teens on Gravier Street. Several blocks away on Palmyra Street, another group of teen drug-slingers hung out, including his junior-high classmate Terrance King. Socially, the two groups traveled as one. “If we went to a party, we all went together. We grew up together from 2 or 3 years old to 15 and 16. We knew the same people and we went to the same schools,” said King, now a 40-year-old theology student living in Atlanta. Recently, because of Senate Bill 16, King finds himself recalling their tumultuous childhoods. “When I reflect on our time in junior high, I see Louis’ face, but I cannot hear any words. That’s how reserved he was,” King said. That night, King sat next to the car’s driver, his friend Latrone Davis. Another car of friends followed in near-gridlock traffic near the popular bar, which sat in a desolate corner near a railroad and highway overpass. Terrance King, now a 40-year-old theology student living in Atlanta, was one of three teens injured during a 1993 shootout that killed his buddy, Latrone Davis, 19, and sent another friend, Louis Gibson, to prison for life. But earlier, someone had told Gibson that Davis and the others in his car were armed and prepared to kill him. Terrified, he aimed his gun and pulled the trigger. As bullets flew, King raised his left arm to shield his face and caught a bullet in the wrist. Next to him, Davis was hit by seven bullets that tore up his chest. Two other friends were also shot, in an arm and a leg. The shooting had all the hallmarks of impulsive, adolescent thinking and peer pressure. Even the hard line typically drawn between victims and perpetrators can seem senseless when teens hurt those around them, who are often friends and peers. So, after a few years of not talking, King and Gibson made amends. After the shooting, Cha-Chi, who was then 16, knocked on a nearby door and talked with Latrone’s mother. “That little girl came to me and cried,” said Linda Davis Williams, now 61. She appreciated the apology, though some people thought she shouldn’t have allowed Cha-Chi in her house. “But they were all friends. That’s the worst part about it,” said Williams, who worked as a cook and fed many in the neighborhood, including the Gibson children. She stopped eating and became terrified about the safety of her other children. She’d walk them to school each morning and wait for them outside at the end of the day. And she was angry, so angry. But over the years, her feelings have softened. “I never thought I’d say this. But I think it’s time to let Louis go,” she said. “He was a child. He made a mistake. But no matter how long they keep him, it’s not going to bring Latrone back. The story is a partnership among the Juvenile Justice Information Exchange, a national news site that covers the issue daily; The Lens; and The Advocate, a daily newspaper serving Baton Rouge and New Orleans, Louisiana.